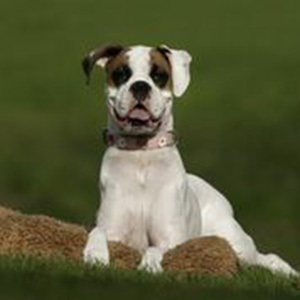 Martha (aka Sweet Martha) is a white Boxer that Nicole’s family got with hopes for her to become a therapy dog. When she was brought home, Nicole’s daughter looked at her and said she should be named “Sweet Martha” after Sweet Martha’s State Fair cookies because she has two “cookies” over each eye and black spots on her body that look like chocolate chips. Sweet Martha has lived up to her name – she is a very kind, gentle and loving dog who seems to read what people need from her at each specific time. Nicole says she can be energetic if the time is right, can lie down quietly next to a child when they read, or provide comfort when someone needs a quiet presence. Nicole and Sweet Martha visit as a North Star Therapy Animals team – primarily at Shannon Park Elementary school where Martha is utilized through the Reading Education Assistance Dogs (R.E.A.D.) program. She helps children gain confidence with their reading skills as well as any other academic need that may arise. Martha’s special skills are also utilized in the adapted physical education program, and she helps out in any part of the school that may need her. Nicole shared a special story regarding one of Martha’s visits. A child in a wheelchair wanted Martha to go out on the playground with her during her gym class. The little girl wanted nothing more than to take a dog for a walk. “To watch her share the leash with me, walk around the playground, and see all the other children come to also talk and socialize with the little girl made me realize that power that these dogs have.” In about five short minutes, the group had gone from 1 or 2 children to around 15! The kids all joined in, walking and talking with the group. The little girl said it was one of the best days of her life – to be able to be like any other kid on any other day, just walking a dog next to her wheelchair and talking to all these kids. Nicole described what a wonderful thing it was to witness and be a part of making a child feel so welcomed, loved, and part of the group. But it’s not all work for Sweet Martha! In her free time she loves to chase squirrels and bugs, play with her older brother George the Bulldog, and go for walks and runs with her mom Nicole. She welcomes the opportunity to play with any of the neighborhood kids. She also loves to play and snuggle with her family and is often found trying to sneak up onto the couch to get “just one inch closer” to her family. Martha is positive that every person and every dog is her very best friend.